The word Buddha means “awakened one” or “the enlightened one.” This title refers to one who perceives directly the illusory, limited, and conflicted nature of reality common to humanity, and the false identity formed on this misguided foundation. With this awakening, everything changes; without it, nothing changes. Awakening therefore is and has been humanity’s greatest challenge. Without comparison, Always Awakening explores how this insight was addressed 2,500 years ago by Gautama Siddhartha, and in a contemporary context, language, and metaphor by Krishnamurti. Always Awakening represents a rare and exclusive collection of candid interviews, over fifteen hours of video with transcripts, with his Eminence Professor Samdhong Rinpoche; a renown Buddhist Scholar, the first Kalon Tripa (Prime Minister) of the Central Tibetan Administration in Exile, a close and lifelong associate of His Holiness the Dalia Lama and the only individual in the world with this cultural background, training and insight to explore Buddhist teachings, personally and for many years, with J. Krishnamurti. Samdhong Rinpoche is a rare gem within the Tibetan Buddhist world and perhaps one of the most lucid and original thinkers. His interactions with J. Krishnamurti will remain one of the most prized encounters in the contemporary Indian spiritual and philosophical landscape. When Buddha speaks of the absolute, I personally do not find any difference with Krishnaji’s teachings or the Buddha’s teachings of Prajnaparamita, or the absolute truth. When Buddha speaks of relative truth, he always compromises with the acceptance and notions and thoughts of people with whom he is speaking, but Krishnaji never compromises or accepts the conditions or the levels of his listeners. Comparative study is valid only fields like Physical Science or History. There is no comparative study in the spiritual field. Therefore, we cannot compare the Buddha’s teachings and Krishnamurti’s teachings. We shall have to be very clear about this… Having said that, we are conditioned or trained in Buddhist philosophy, logic, metaphysics, etc. When we come to Krishnamurti, his message compliments or resonates with a person who has a Buddhist background. In a similar way a person familiar with Krishnamurti’s insights will find that his message compliments Buddhist philosophy. Our efforts must be in this direction, not finding similarities and dissimilarities. Not comparing. Not finding agreements and disagreements. Using Buddhist language agreements and disbarments are all in the realm of relative truth and there is no end. But the modern western learner has been trained in comparative study. That is a good academic exercise but it does not help understanding Krishnamurti or understanding Buddha. Explore the full Interviews on this site with a Membership. Sustaining Membership is $10/mn. Cancel anytime. Membership gives full access to over fifteen-hours of video, plus transcripts, sitting with the only Buddhist in the world with Samdhong Rinpoche’s training, his culture and tradition. Always Awakening is much more than a “good read” beginning with an outstanding title that says a great deal. If one is willing to move slowly and reflectively the dynamic interplay between the “right and left” pages can be a form of dharma practice in itself. 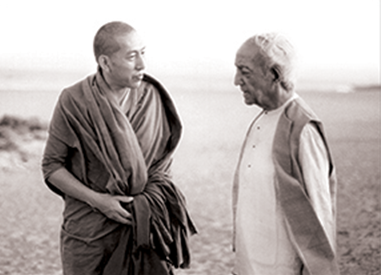 Rinpoche’s point that Krishnamurti helped him understand Buddhadharma and Buddhadharma helped him understand Krishnamurti is very important. Always Awakening helped refine my understanding as well. Reading the book for a second time is a joy. Always Awakening beautifully interweaves the exquisite harmony of Krishnamurti’s mind and the deep affinity for illumination he shared with the Buddhist tradition. Trustee Emiratis of the Krishnamurti foundations of America and India. This is the most important book on Krishnamurti ever written and I have read them all. Reading slowly, listening quietly I am finding jewels of insight on every page. I understand Krishnamurti more directly and the same can be said of my understanding of Buddhism. Symphony Conductor, former chair of the Krishnamurti Foundation of America Board of Trustees. Professor Rinpoche Samdhong shows that Krishnamurti’s teachings can resonate with others of the non-dual tradition. In other words, the principles that Krishnamurti was teaching can be found without ever having read Krishnamurti. Always Awakening reminds us that there are many ways in which timeless precepts can and have been presented. There’s more than one way to cross the ocean using different means over time. Always Awakening renders me somewhat speechless! It confirms what I had felt after 12 years in Tibetan Buddhism - that there was no difference at the deep level between Tibetan Buddhism and Krishnamurti. I haven't finished absorbing the book, perhaps I never will. It has the effect of drawing apart a heavy curtain. Always Awakening is a fascinating, deeply significant study! Always Awakening is a religious “experience” more than reading a religious text, an experience that invites a leisurely but rigorous journey toward a deeper understanding of both Buddhism and Krishnamurti’s insight. Turning the pages one feels as if they have been invited to silently participate in a most intimate and wise conversation. Always Awakening is not a book to be read quickly, rather savored, slowly and thoughtfully. With luck, as described in the introduction, you will catch wind of what Krishnamurti called “the perfume of the teachings” or catch a glimpse of your own “Buddha nature” along the way. Always Awakening is a beautiful experience. 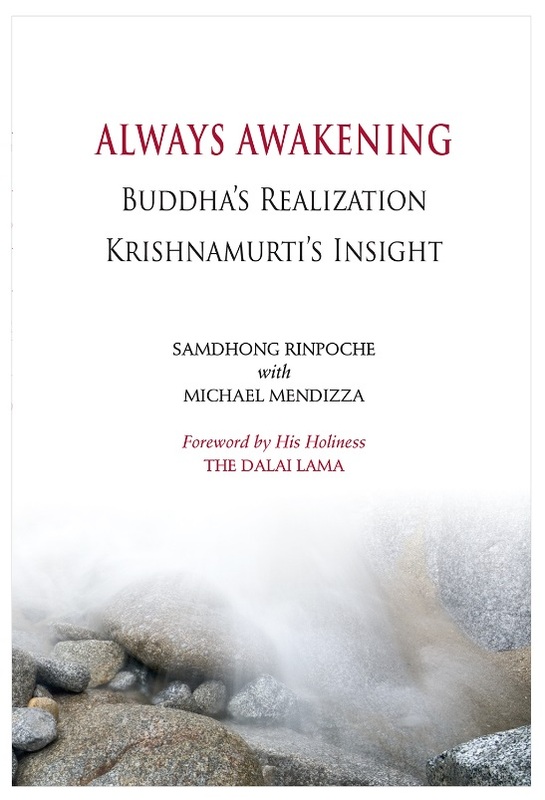 There are times when it is possible to imagine that a conversation between a real life Gautama Buddha and a real life J. Krishnamurti might have sounded very much like the conversation between Samdhong Rinpoche and Michael Mendizza in this book. It is a dialogue of utter impeccability and integrity. Those wishing to listen to the voice of liberation can do no better than to have a ringside seat to this conversation. Krishnamurti’ s teachings are not always easy to understand and yet, equally true, they are so simple, precise and to the point. One does not have to spend years in a monastery or specific training to understand his teachings. They are clear and condensed, pure, distilled simplicity. After reading Always Awakening my connection to Krishnamurti has grown even more, if that is possible. Krishnamurti made it so simple compared to some teachings, like Buddhism. For serious Krishnamurti admirers what Michael has gathered and shares inspires us to read and attune with Krishnamurti even more, not necessarily to study Buddhism rather, an understanding of core Buddhist principles helps us understand Krishnamurti’s teachings more directly, just as this material will help an open minded Buddhist to understand and live Buddha’s teachings more simply. Samdhong Rinpoche does a great job describing how a classically trained, precise Buddhist mind views and understands Krishnamurti. Reading, it became very clear that Krishnamurti was a contemporary, modern day Buddha. As Rinpoche explains, Krishnamurti kept his teachings on the absolute level for a reason.. He spoke to the modern world but both, Gautama, the Buddha and Krishnamurti had the same insights. Always Awakening helped me clarify and solve the riddle for myself. Krishnamurti’s insights are enough for me. He covers everything. It is all there. I am now free and content to stick with Krishnamurti without feeling I might be missing something from Buddhism or another path. Your book is a great gift to those still seeking or wondering if Krishnamurti is enough. Long time spiritual seeker who has read and studied Krishnamurti’s teachings and has been a serious student of Buddhism for years for over thirty years. Always Awakening places Krishnamurti’ s insights in a historical context. Rinpoche Samdhong notes: “There is only one enlightenment. All who realize this see the same thing. How they express what they now understand is relative to the time, culture, and the audience.” Implicit in this awakened insight or realization is freedom from the mind caught and enchanted by image and concept. In the Christian tradition the outstanding mystics were people like Meister Eckhart, St. John of the Cross. This use of the term has nothing to do with the popular use of the term. In the strict orthodox use of the word, `mysticism,' in the Greek it meant ‘hidden,’ simply ‘hidden.’ Specifically, ‘hidden to the mind of image and concept.' In other words, they were saying ‘direct experience.’ A mystic is a man who perceives directly. St. John of the Cross, one of the great exemplars of this tradition, had a beautifully clear image. He said, "If I have my hand in front of my eyes, I cannot see the sun. If I have an image of God, I cannot see God." And it's as simple as that. When we say Buddha, we naturally think of the Indian prince Gautama Siddhartha who reached enlightenment in the sixth century BC, and who taught the spiritual path followed by millions all over Asia, known today as Buddhism. Buddha, however, has a much deeper meaning. It means a person, any person, who has completely awakened from ignorance and opened to his or her vast potential of wisdom. A Buddha is one who has brought a final end to suffering and frustration, and discovered a lasting and deathless happiness and peace. The synergy of these two observations, West and East, is simply that they are describing the same thing. Perceiving directly ‘what is hidden by the mind if image and concept,’ is, in Eastern parlance, ‘awakening from ignorance.’ All of us, now and then, see through our preconceptions and see directly that the ‘King has no clothes,’ that the images and related feelings we attribute to our social-self mage and beliefs are just that, ‘images’ void of independent reality. With this insight Krishnamurti, as we think of him, as well as what we think of ourselves and others disappear, leaving only the direct perceptions being described. And because the mind preoccupied with image and concept is in time, time being an image and concept, freedom from this implies that these direct perceptions, the so called teachings, are timeless. They are as fresh and alive when grasped or perceived as with the original insight. Great teachings are timeless. Always Awakening invites you to discover this for yourself.